On February 11, 1858, Bernadette Soubirous, 14, went to gather firewood with her younger sister and a friend. When they came to the canal near the River Gave, the other girls waded through, but Bernadette stopped to take off her stockings. As she told the police chief ten days later, "I heard a very loud noise in the hedge above Massabielle Grotto; I looked that way and I saw the bushes moving, and behind them something white; I looked a moment, then I knelt and prayed; That One smiled at me and vanished into the Grotto." Over the next five months, Bernadette saw the lady she called simply That One ("Aquerò") at the Grotto 17 times more, accompanied by ever more onlookers as word spread. No one else saw the apparition, but many were convinced by the girl's radiant, angelic countenance while in ecstasy. On February 25, "She told me to go, drink of the spring." That One indicated some bare ground near the grotto. Bernadette dug there with her hands. "But there I only found a little muddy water. At the fourth attempt I was able to drink. She also made me eat the bitter herbs that were found near the spring, and then the vision left and went away." The 300 witnesses were disconcerted to see the angelic face covered with mud and grass. On March 1, Bernadette's friend Catherine Latapie regained the use of her dislocated arm after plunging it into the spring, now a torrent. It was the first of the many healings at Lourdes. On March 25, Bernadette asked the Lady's identity. "She lifted up her eyes to heaven, joined her hands as though in prayer, … and said to me, 'Que soy era Immaculada Concepciou,'" incorporating into the uneducated girl's Pyreneen dialect the terminology of the papal dogma issued four years before: "I am the Immaculate Conception." St. Bernadette became a Sister of Charity of Nevers, where her incorrupt body is now enshrined. Our Lady of Lourdes became the major Marian devotion of the next century, beloved as a source of spiritual and physical healing, a beacon of faith. 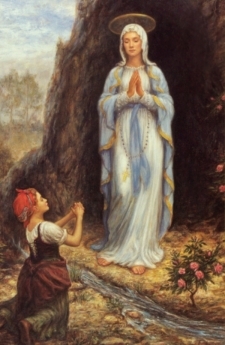 The image of Mary as Bernadette saw her -- standing, hands folded in prayer, a long white veil over her head, a long blue sash hanging from the waist of her white gown and a long white rosary from her arm -- has been reproduced around the world in every country where Catholics have had a presence, and even the Grotto itself (Philippines, Indonesia). The Catholic Church celebrates February 11 as her feast day, though in Lourdes, the biggest pilgrimage is on the feast of the Assumption, August 15. Maximilien-M. François, "Sainte Bernadette et Lourdes,"
Bernadette Soubirous is born the first of four children in a financially ruined family from a small town in the Pyrenees mountains in France. She was the eldest of six children of Francis Soubirous and Louise Caserot. Bernadette first encounters Our Lady in a golden cloud and prays a Rosary in her presence at the grotto. Her sister Marie told their mother all about the incident and her mother forbade Bernadette from returning to the grotto. Two influential ladies, Madame Milhet and her seamstress, Antoinette Peyret, request a visit to the grotto with Bernadette in order to obtain the name of the appearing woman. Our Lady asked her to come another 15 times and promised her happiness not in this world but the next. Bernadette's mother accompanies her to the grotto. The Lady teaches Bernadette a secret prayer which she recited the rest of her life. Bernadette is accompanied by large crowds and in particular, Dr. Pierre-Romaine Dozous, the town's most eminent doctor. He evaluates her conditions and announces that there is no indication of "nervous excitement". Despite being told she was imagining everything by the imperial procurator and being called a liar by the police who threatened to imprison her, Bernadette shows up at the grotto but does not encounter Our Lady. Our Lady appears to Bernadette and gives her "three wonderful secrets" which have never been revealed. Our Lady stresses "Penitence" at the next apperance. Bernadette is commanded to bathe in and drink from the fountain. Since there was no fountain there, Bernadette digs up some gravel and reveals a pond which she then drinks from and washes her face. This stream instantly becomes a source of healing for visitors to the grotto. Bernadette is asked to "kiss the ground on behalf of sinners". Bernadette is asked to tell the clergy that they should build a chapel at the grotto. Bernadette is told that the people should come in procession to the chapel. Twenty-thousand people gather at the apparition site. No sign is performed despite the request of the parish priest, Abbe Peyramale, to have a rosebush bloom in winter. Dr. Dozous observes Bernadette putting her hand through the flame of a candle without feeling pain or getting burned during ecstacy. Bernadette receives a final invitation to meet the Lady at the Grotto. Bernadette sees the Lady for the final (18th) time. Bernadette goes to study at a hospice run by the Sisters of Nevers. An investigative commission is established. The Bishop of the Diocese of Tarbes declares the apparitions to be authentic. Bernadette leaves Lourdes for the final time to join the Sisters of Nevers. She is given the name of Sister Mary Bernard and worked there as sacristan and avoided publicity as best she could. She referred to herself as "a broom which Our Lady used, but now I have been put back in my corner." The Basilica at Lourdes was consecrated. Bernadette dies at age 35 and is buried in St. Gildard Convent in Nevers. Pope St. Pius X proclaimed that it be observed throughout the universal Church. Bernadette is canonized a saint by Pope Pius X on the Feast of the Immaculate Conception. Pope Benedict XVI makes a pilgrimage to the Lourdes for the 150th Anniversary of the apparitions. "She has the appareance of a young girl of sixteen or seventeen. She is dressed in a white robe, girdled at the waist with a blue ribbon, which flows down all along her robe. She wears upon her head a veil which is also white; this veil gives just a glimpse of her hair then falls down at the back below her below her waist. Her feet are bare but covered by the last folds of her robe except at the point where a yellow rose shines upon each of them. She holds on her right arm a Rosary of white beads with a chain of gold shining like the two roses on her feet." After a 4 year investigation commission, the bishop of the Diocese of Tarbes declared on January 18, 1962: " We judge that Mary Immaculate, Mother of God, really appeared to Bernadette Soubirous on February 11, 1858, and on subsequent days, eighteen times in all. The faithful are justified in believing this to be certain." O Immaculate Virgin Mary, Mother of Mercy, you are the refuge of sinners, the health of the sick, and the comfort of the afflicted. You know my wants, my troubles, my sufferings. By your appearance at the Grotto of Lourdes you made it a privileged sanctuary where your favors are given to people streaming to it from the whole world. Over the years countless sufferers have obtained the cure for their infirmities -- whether of soul, mind, or body. Therefore I come to you with limitless confidence to implore your motherly intercession. Obtain, O loving Mother, the grant of my requests. Through gratitude for Your favors, I will endeavor to imitate Your virtues, that I may one day share in Your glory. Amen. Christ, graciously hear us. God the Father of Heaven, have mercy on us. Exalted model of all mothers, Our Lady of Lourdes, Pray for us. Mother who did suffer so much, Pray for us. Mother poor and without shelter, Pray for us. Mother who did bear along forgotten roads the fruit of thy womb, Pray for us. Who did find no other shelter for thy Son and our God than a wild cave, and no other cradle than a manger, Pray for us. Who did declare, "I am the Immaculate Conception," Pray for us. Who did appear to a humble peasant girl in order to teach us humility, Pray for us. Who was clad in a white robe to remind us of purity, Pray for us. Who did wear a girdle of blue to remind us of Heaven, Pray for us. Who did tread on a rosebush to remind us of the sufferings we must endure in order to merit Heaven, Pray for us. Who did carry the rosary to induce us to pray, Pray for us. Who had thy hands joined and thy eyes raised to Heaven to draw us to penance, Pray for us. Who is the Star of Hope, Pray for us. Who prays to the Sacred Heart of Jesus for us, Pray for us. Who gives strength to the clergy, Pray for us. Who heals the sick, Pray for us. Who is the health of the weak, Refuge of sinners, Pray for us. Our Lady of Lourdes, conceived without sin, pray for us who have recourse to thee. Lamb of God, Who takest away the sins of the world, graciously hear us, O Lord. Lamb of God, Who takest away the sins of the world, have mercy on us. Pray for us, Our Lady of Lourdes, Holy Mother of God, that we may be made worthy of the promises of Christ. Let us pray: Our Lady of Lourdes, so fruitful in miracles, protect, with that hand which nothing can resist, our Holy Father the Pope. Infuse into us the spirit of faith, hope and charity. We all believe the truth of thy apparitions, and the unlimited power with which thy Divine Son has armed thee. Hence it is that we have recourse to thee. Our Lady of Lourdes, pray for us. Mother, have mercy on us. Our Lady of Lourdes, heal us for the greater glory of the Holy Trinity. Our Lady of Lourdes, heal us for the greater glory of Our Lord Jesus Christ. Our Lady of Lourdes, heal the sick, convert sinners. Health of the sick, Help of the suffering, pray for us. and with you we sing the wonders of God. Is from countless ills secured. Hail! sweet Notre Dame de Lourde Hail! sweet Notre Dame de Lourde. Through this darksome vale of tears. Hail! sweet Notre Dame de Lourde. Empress of the starry sky. Dearest mother, at thy prayer. Blessed, most pure Virgin, you chose to manifest yourself shining with life, sweetness, and beauty, in the Grotto of Lourdes. Obtain for me, O loving Mother, this special request....(state your intention). Our Lady of Lourdes, Mother of Christ, pray for me. Obtain from your Divine Son my special request if it be God's will.